We hear it every year at our business summit and see it year after year in our Benchmark Report, the biggest issue facing the green industry is finding good employees. It’s a common theme for green industry businesses, especially those that are growing. The demand for their services is high, but finding well-qualified, legal employees is difficult. Once you do find employees, the next challenge is training them. Good, hard-working employees are a part of the equation, but if you don’t properly train your employees, they won’t be successful. The first thing you need to do is start documenting your processes. You don’t need to document every process immediately, but start with the 20% that make up 80% of your work. Don’t limit your documentation to your field workers, either. You should also document your sales process and how your office handle incoming calls. 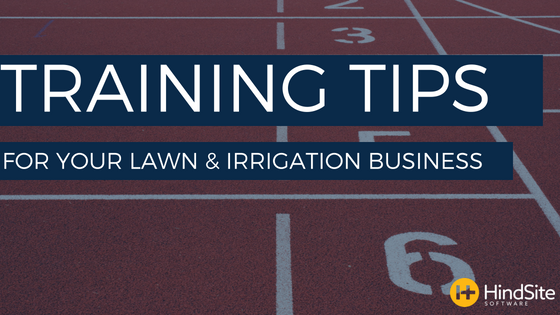 And even how you schedule winterizations in your irrigation business. Not only will documenting your processes help your employees, but it will also likely help you refine your processes. Sitting down and writing each process will make you think about better ways to service your customers. Next, map out your training schedule. Start by documenting what you’ll teach new hires and how. Will your new technicians shadow another technician? For how long? How will you train other roles, like office managers or sales reps? How will you train on your core values? Then, create a regular training schedule. Maybe you’ll have a regular Friday meeting where your team leaders or managers discuss how to mow a lawn. Or, you could schedule a longer meeting once a month or once a quarter. And, you’ll likely want to schedule “kickoff” training events at the beginning of the year and the beginning of the snow season. Creating a regular training rhythm will help you better plan your training events. Many of our customers create assessments in our software to help them measure the quality of their employees’ work. What they typically do is have a manager go to the property and review the work the employees performed, entering that data into their tablet or smartphone to sync to HindSite. That quality assessment is a great way to build training opportunities into your business. Every week, the manager can bring one or two of those assessments in to a 15 minute meeting to review a team’s work. When most people think of training, they don’t get excited. Most companies throw you a manual or make you sit through boring presentations in order to train you. It’s death by Powerpoint. But training doesn’t have to be boring. Especially in a green industry business, training should be hands on and fun. Have your lawn maintenance teams battle for an award based on the quality of their work. Give away tickets to sporting events when people achieve a training goal. Do things that encourage your employees to learn. It’s also important to reinforce the positives while you train. Being too negative when people don’t meet the desired results hurts team morale. Instead, incentivize and reward; positive reinforcement can go a long way.